The H8/3664 is the only processor in the H8/Tiny range that is available with through-hole mounting. This is a 42 pin shrink DIP package that will need to be mounted at 45 degrees on a piece of 0.1 inch pitch protoboard for those of you who don’t want to make up a PCB or who don’t fancy hand-wiring to the pins of a flat pack package. Click the picture for a larger version you can print. There is nothing unusual about this circuit exceptthat I have chosen not to implement the 32.768kHz crystal for the real-time clock so the X1 pin is grounded to shut down the oscillator. 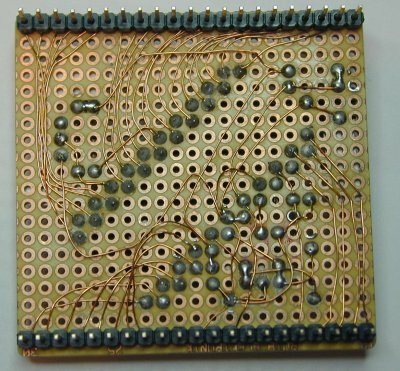 All the useful pins are brought straight out to a pair of 21 pin headers so that it can be plugged into a solderless prototyping board. The crystal frequency is your choice but a 16MHz crystal is simplest and will have the processor running at full speed. Here is a picture of an early version of the board in use. You should be able to work out how to mount the shrink DIP package quite easily. Top right you can see the MAX202-based RS232 level shifter and a three-pin serial connector that goes straight to the PC. The underside of the board shows the wiring technique using solderable polyurethane coated wire. Not my neatest wiring job, but not far off if I am honest. Two solderless protoyping boards are used and the dimensions of my carrier board have been chosen for convenience when plugging it into them. Connections can now easily be made to any circuits I want to connect. For example, here you can see a very scruffy LED array indicator I use for testing several I/O pins in parallel. 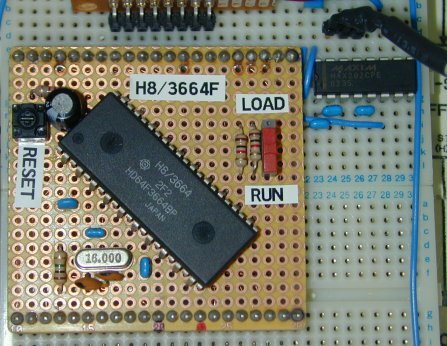 It is just an 8 bit buffer chip suitably connected up. Connect the PC serial port to the TXD, RXD and GND pins on the processor. Be sure to use suitable level converters to get 5V serial lines. Press RESET to run your program. It could hardly be easier. No special hardware – just make sure you have an RS232 level converter. 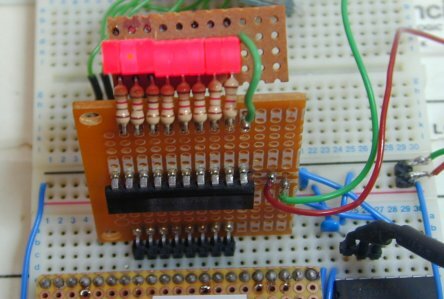 A simple circuit built using a MAX 232 will do the job.